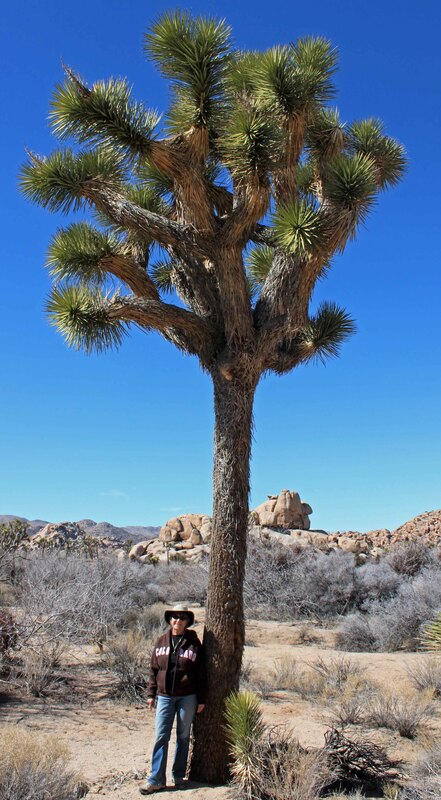 Just a little north of Palm Springs CA is Joshua Tree National Park. It is a fascinating place where the Sonora and Mohave deserts meet. 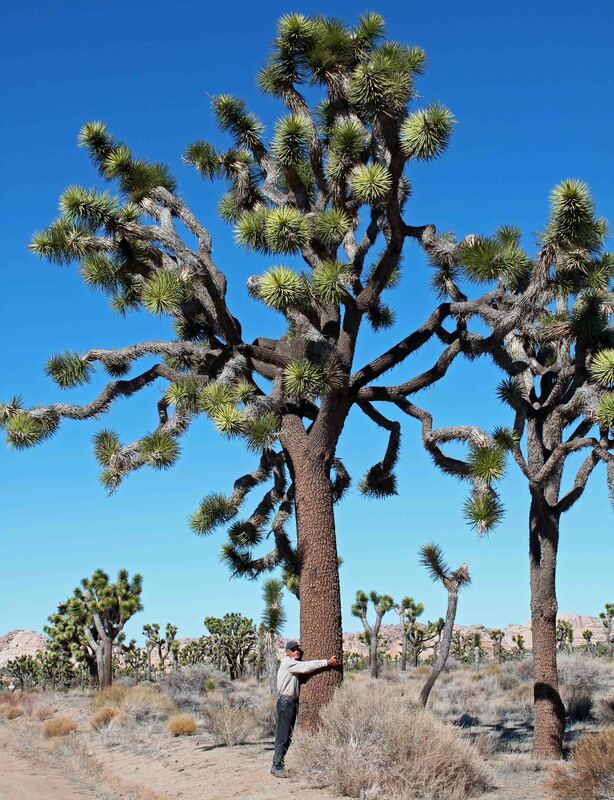 The high country (3ooo to 6000 feet) is Mohave and home to the fantastic Joshua Trees. These trees look like something from Dr. Suess. The wild prickly arms are not a cactus but a type of yucca. After each bloom there is a new branch. Some trees live 100 to 200 years and grow to 40 feet tall. The park protects and preserves these trees as well as the amazing granite rock formations which seem unique to this area. We’ve enjoyed good hiking here. 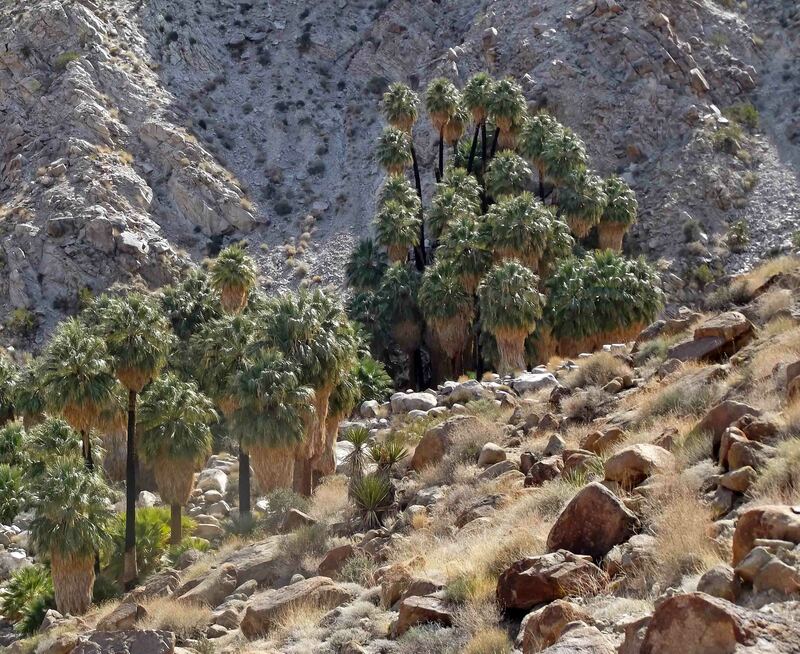 One of our favorites is 49 Palms Canyon which leads to a beautiful palm oasis and the only site in the park with year round water. The California Fan Palms tower over the landscape and provide a refuge for all kinds of wildlife as well as people. We saw a desert tortoise, coyote and hummingbird during our brief picnic at the palms. We also saw a beautiful kit fox on an earlier hike to some of the fantastic rocks. 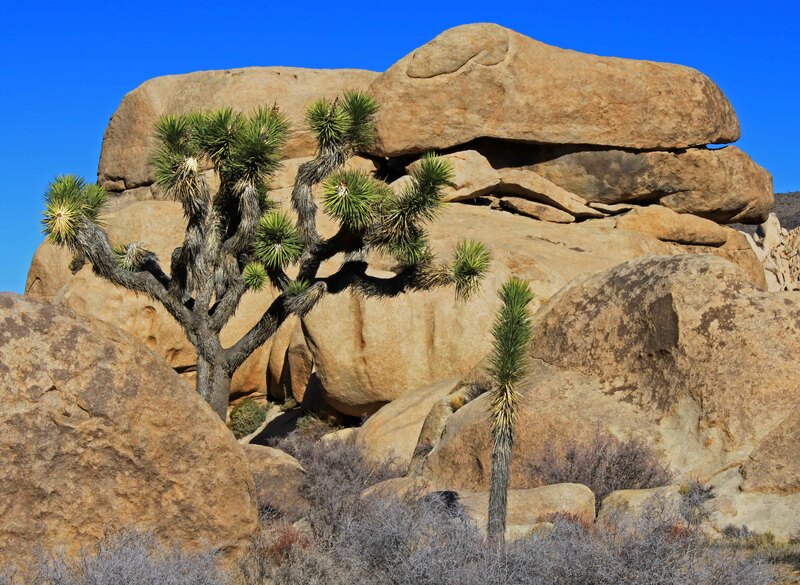 Joshua Tree has great picnic areas and campgrounds. It is also very popular with rock climbers. 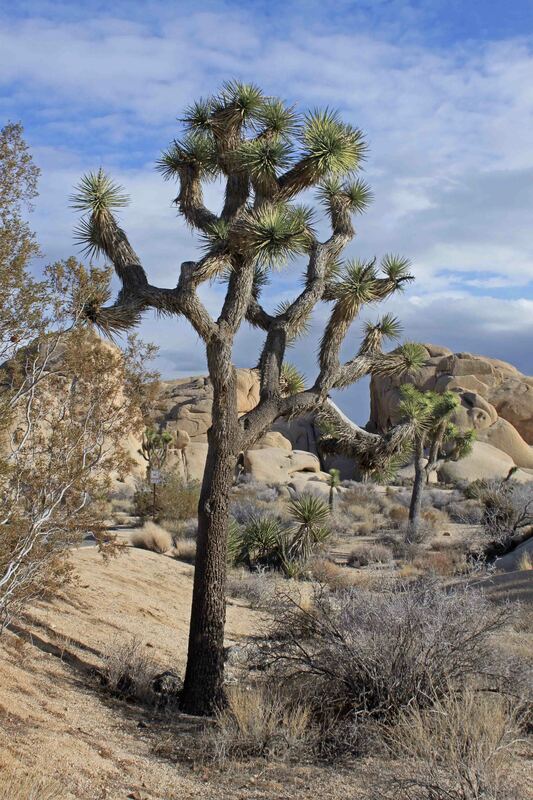 This entry was posted in California, Desert, national parks, Uncategorized and tagged Flora, Joshua Tree National Park, Nature. Bookmark the permalink. Hi Lynn. As you can see we are having a blast in the West. Its so much fun to take our time and really soak up new places. Each place leads to us to 2 or 3 more. Dr. Seuss trees. I like that. 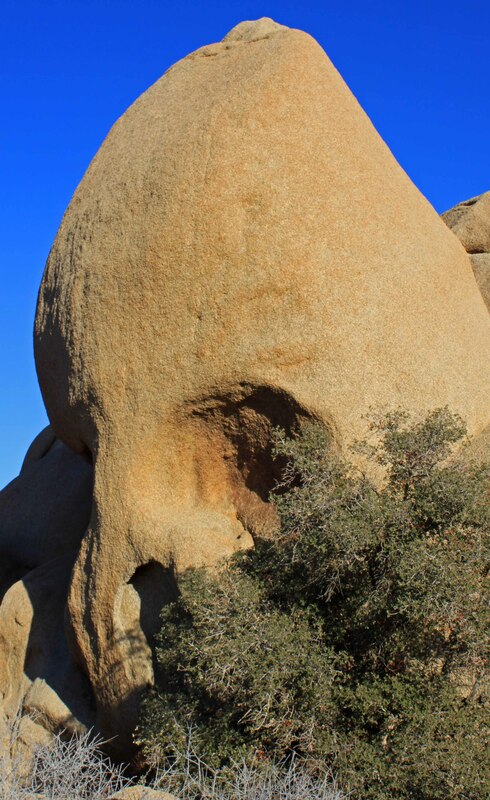 We had at great time at Joshua Tree. It became a game to find the most bizarre trees. What an amazing landscape. Nice images Randy. I especially like the first and the last one. Thanks Ron. I really like that first one too. It was on a quick hike late in the day and the light was pretty nice.